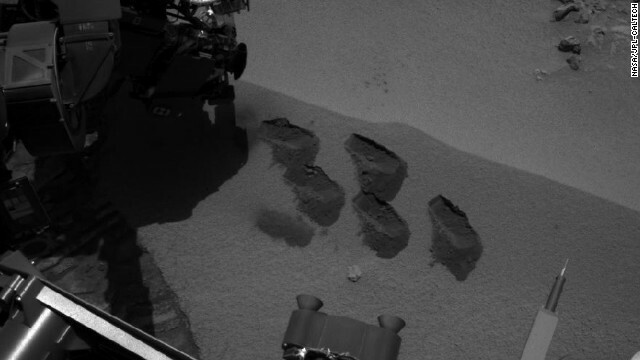 The Mars rover Curiosity has been sitting in a place called Rocknest scooping up Martian material. The Mars rover Curiosity has revealed that the radiation levels on Mars are not, according to initial measurements, lethal to humans. “Absolutely, astronauts can live in this environment,” said Don Hassler, Principal Investigator for the rover’s Radiation Assessment Detector, at a press conference Thursday. But don’t plan on booking a trip yet. You still have to add up the total radiation that you would soak up during the eight to nine months that it takes to get to Mars, and the eight to nine months back, not to mention the actual time on the surface. An astronaut would need to spend at least six months on the surface, and stay within the career limits for radiation. Characterizing the radiation on the surface of another planet has never been done before now, Hassler said. Over time, researchers will get all of those radiation numbers to create a better assessment of exactly how much radiation a person would experience during a Martian journey, Hassler said. Since Curiosity arrived via some jaw-dropping landing maneuvers on August 6, the rover has not seen any large solar flare or solar particle event, Hassler said. But it did detect some of those while en route to Mars. It appears that the radiation measurements are a factor of 2 less than during the trip, which isn’t surprising, given that the planet’s atmosphere offers some protection, Hassler said. When a solar particle event does occur, that will tell researchers more about spikes in radiation that astronauts might experience. It’s important to understand how much radiation is hitting the planet in order to get more insight into Mars’ habitability – past, present and future. The rover has also recently measured the variations in the atmospheric pressure on the planet. Scientists found that there are daily variations in atmospheric pressure. Of course, Mars does not shield its surface from radiation the way that Earth does. Mars appears to have lost its global magnetic field 3.5 billion years ago, whereas Earth still has one. And the atmosphere of Mars is about 1% the thickness of atmosphere on Earth. This is just the beginning of taking these measurements, says Hassler. Scientists are also using Curiosity to measure the wind and weather on Mars. Right now, the area where the rover is in springtime. Temperatures will get warmer in the next few months as the planet gets closer to the sun; this is a factor in determining the season on Mars, said Ashwin Vasavada, Deputy Project Scientist for Mars Science Laboratory at NASA’s Jet Propulsion Laboratory. Curiosity is parked in an area called Rocknest, where it has taken several scoops of soil. These scoops help to clean out its instruments, and some of them got analyzed for their mineralogy. The first scoop was on October 7. Curiosity may start moving again in a few days, the scientists said. any truth to the reports that the Curiosity rover spotted a Mexican?? Even if Mars proves it ever supported microbial life form(s), that does not mean it could support or even could have ever supported humanlike life form. To sustain a humanlike life you need an atmosphere that contains enough oxygen and an ecosystem that recycles it (i.e. soil, plants and water) like on Earth for starters! Earth has a very sophisticated electromagnetic shield that protects us from the solar and cosmic rays! Earth is at the right distance from the sun with the right gravity to support life conditions (habitualness!) Earth is the only known spatial object to have organic material in its regolith! Mars, on the other hand, has a very thin atmosphere (less than 1% that of Earth) containing mainly carbon dioxide (what we exhale!) Mars is completely exposed to the sun's and cosmic radiation without any protection! Mars atmosphere does not allow the formation of water on its surface! Mars regolith is made of mainly iron oxide (rust!) Mars gravity is 62% less than that of Earth! That is a very basic and generic recollection of understanding the extremely complex life-sustaining environment here on Earth and in comparison to Mars! send me please!! we should be spitting out astronauts like cheeseburgers at mcdonalds now that we have private comps providing the space veh. I'm really tired of the "big sell" about MARS. I realize going there is a big accomplishment but I think we can quit now. It's obvious that Mars will never be a popular vacation spot. NASA should find something else to do, IMO. 1% oxygen, acceptable radiation, no water (yet), temperatures high enough to BBQ humans....tell me again why all the money is spent on investigating Mars?????? Temperatures on Mars are cold enough to freeze humans, not BBQ them. What are you talking about? The warmest summer time temps are probably going to be in the 70's, maybe. Get your facts straight. 1) The money was spent to educate people like you about what's really out there. 2) It's not like NASA took two billion dollars and fired it into the surface of Mars. We wouldn't learn much from that. The money went to purchase raw materials, pay skilled workers to craft a new rover, and fund the scientists who use those tools to deliver real results. Space research has affected every facet of your life. Whether you know it or not. Even that machine on your lap that you use mainly to complain has a long and storied history with the space program. There is no reason to spend many Billions of $$$ to send Astronauts to Mars for a brief stay and do the same experiments and take the same pictures Curiosity and other Rovers already have...better to develop a new generation of Rovers and send one to every Planet instead. Well, Mars is sort of a proving grounds for other rovers/probes. With every successful and failed rover landing, we gradually learn what can work and what may not. Remember when NASA lost one orbiter because one team used metric, while the other used standard? You can't do much science with rovers compared to humans. With a human mission you could do so much more than with rovers. But I see what you mean, and that's why you don't send them out and back – maybe on the first mission, but after that, you send people there to stay, build a base/colony. Do you think we could send our current pres there, to be president of a planet? No, but you guys have a former candidate looking for a job, don't you? I mean it ain't Kolob, but he definitely belongs an another planet. All you crazies are looking to secede.....there you go! Why don't you go and take Rawmoney and Sarah Palin with you and start a nut colony. We know for a fact astronauts can inhabit the moon for at least 3 days where there is NO atmosphere or magnetosphere. Mars at least has some atmosphere and is farther from the sun. Launch the astronauts now! Is the Phrophet Mohamed there? Is Johova for the Jews oor Christ around there any were...Tell him that his people need hiim..Are theere any Greeks there?Are we claming mars in the name of America? ?What do the women look like..Are there any Jewish or Muslem male pimps wee the Jews do not allow females to pray at the Wailing Wall..did you know that..We do not want any religion in Mars..or on Mars..
With the way the Mid-East is looking, there may be more radiation on Earth soon. Maybe there already is. All the nukes tested during the Cold War, and radioactive material dumped in the ocean and buried in deep wells that seep into the ground water. Mars may be radioactively clean by comparison. The Middle East looks exactly the way it has for as long as I can remember – and that spans several decades. "overpaid"? Scientists "overpaid"? Instead of wasting everyone's time with nonsensical posts, why didn't you use the time to do a simple search for the info and determine if you were right or wrong? Why doesn't that ever occur to people like you? Here you are, living in the age of instant information, and you willfully choose to go without. Even worse, you form strong opinions and beliefs and make statements based entirely on the absence of information. Why do you do it? The average scientist doesn't get paid a lot; especially if their employer is a university or the government. Maybe if you had finished elementary school you too could be enjoying those fat paychecks. what SPF will we need? At least they can spell correctly,unlike you! Dig a deep valley - will be very hot at the bottom - thick H2O and CO2 cloud cover will protect against radiation. Put a roof over the valley ? Superconducting magnetic ring around Mars equator to deflect Solar Wind from eroding the atmosphere. There's something elating about reading "Mars's habitability" - past, present, and *future* in complete seriousness. Colonizing other worlds is our only option to avoid extinction. Take a good look around you at beautiful planet Earth: everything that you see will be blowing sand in a mere ~600 million years (I know that sounds like a long time, but it's a blink of an eye in geological/astronomical timescales). Sol, our sun, is approaching the end of its life as a main sequence star. The end may not be nigh - assuming gamma ray bursts, meteor/asteroid/comet impacts, or self-inflicted extinction don't hit us before then (and there's every reason to suspect that any of those are possible, even probable on that time scale), we have 600 million years to leave the nest - or face extinction. I truly hope our ancestors will make the right decisions, but making the right decisions needs to also occur *today. * The survival of the human race, and very likely all of what remains of Earth's biosphere (as I'm sure we'd bring entire ecosystems with us), depends on it. Don't worry, no one will read all that text, its way too much! I read it as meaning that you were already thinking from a future perspective, such that we, now, are your ancestors. Earth does have H2O as a temperature regulator. Was warm, even during the ancient Dim Sun. Artificially shedding the atmosphere would cool the surface. These articles are a big joke. The magentosphere of Mars will never support anything resembling human life. Do not need a magnetosphere - dig a deep valley. Magnetic field is useful for protecting Martian atmosphere from Solar Wind Erosion. The mission is focused on the possibilitty of creating a life sustaining atmosphere. Looking at the satellite imagery of the Moon, you can clearly see the landing sites. You're a kook. Let me guess . . . you don't believe in global warming either and you voted for Romney? Maybe now Newt Gingrich can abandon his plan for a moon home and move to Mars. ..and take his creepy looking wife with him..She'd fit right in...she looks like an alien. I don't envy the engineers or scientist that must alanyze and extract this new exploratory science because you have to be 100% accurate in almost everything you do on Mars and in the outer space in general. Studying more on other planets isn't exclusive properties of learning about Mars but teaches us how to improve life on Earth as well. We need to continue the budget of NASA or increase it by 2 fold to 1% of our budget for more research into these crutial issues of our universe. Republicans pollute the gene pool. As long as we don't let some greedy corporation construct cheap domes that don't keep out the rays, we'll be all right and non-mutated. Phew, it's good to know radiation levels in Mars aren't lethal to humans. What a relief. Now I can take that trip I've been planning ! We need a TSA radiation comparison - Which is safer ? Opt out Groping before takeoff to Mars ? There would be complete cloud cover, similar to Venus and the Gassy Giants. Daytime temps can get into the 70's and lower 80's, in summer, at the equator. No boiling oceans on Mars. Go back to school, or merely reference Wikipedia next time. Not only that, the martian leader taxed them to death. They then learned the rich martians only had enough money to run mars for like a week, and they rioted and died off. I get antsy after 3 hours on a plane...no desire to spend 9 months in a box to get to Mars...live months in a box while there and then months returning in a box. Folks have this misperception of roving around and hopping on the surface...won't happen. You'll need shielding from radiation, temperature etc. 99% of the time on the planet. "A bit more' radiation is 'too much' once you've absorved high levels. Gee, could the lack of radiation on earth have caused the extinction of martians here? A few weeks until the Fiscal Cliff Event–thus it is increasingly difficult to contemplate spending untold billions on a manned Mars Expedition. The answer, by the way, is 42. No need to search any further. The reason why this research is critical is because at some point (long time in the future – but the day is still coming) where the human race will need to expand beyond just earth for the race to survive. Regardless of what you say or think, our primary purpose (as a race) is to try to survive (like all life forms). If all generations going forward think that space exploration isn't critical, we guarantee our own extinction. America was founded by those willing to give up everything for a chance at a new life – now we seem to be dominated by those ununable or unwilling to see the irony in how we view this today. Actually your race has done this. You all were placed here by my people long ago. We left you basic knowledge and now you're almost ready to do what we did centuries ago. Dig a deep Valley - the bottom, at 1 Earth atmosphere pressure, will be hot. Run a heat engine to cool and generate electricity - Happy Mars camping. The Valles Marineris on Mars is already nearly 5 miles deep. Just start thre. So, greenhouse gasses help prevent cancer in humans both directly (shielding from radiation) and indirectly (ozone recovery rate). "Greenhouse Gases in the Atmosphere Cool the Earth! " Mars has a lot of CO2 - that is why so Cool ? Hate to say this, but most likey the first ppl going to mars will go on a one-way trip. That is, they will go with the expectations that they will spend the rest of their life there, or until we develop a fast safe way to return. However, it is also cheaper to go one-way. In doing that, it increases all risks, except for radiation, but, it dramatically, lowers the price. "going to mars will go on a one-way trip"
We have to wait until the Evil World Order increases life span of GMO Über Humans. What are the levels like on Uranus? Would the radiation penetrate the republican bubble? Would Gary Stang be a viable astronaut with only the bubble to protect him? I don't have to worry about the 8-9 months of radiation on the return trip, I'm not coming back. I don't know if you were kidding or not, but this is a really important point. We need to stop thinking about bringing someone back from Mars. Make the first mission (and potentially many after it) one-way trips. It'll be cheaper, faster, easier, and more likely to succeed, and there would be zero difficulty finding quialified appliants. Sign me up. I'll alert the scientists at NASA. This should save the MARS program time and money otherwise wasted on radiation analysis. how sad. there is so much science and engineering we could do here on earth to make life better. but it isn't flashy, and doesn't provide the intellectual escapism of people flying for months or years on "big wokit ships". is it interesting to discover distant planets, figure out black holes, ? yes. but you have to acknowledge your limitations at some point. oh, the spirit of human discovery, bla-bla-bla. this isn't columbus sailing around with all the air and fish he could ask for. really? you have to acknowledge your limitation? Who are you to say what the limitation is of humans? frankly, I'm glad science is left to those who have vision and the intellectual capacity to pursue that vision, as opposed to someone like you. We need to explore Mars cause we are running out of prison space and need somewhere to send these people. And where, exactly, do you think this money is being spent? Do you think they box it up in crates and ship it to Mars? i find it funny how a planet killing asteroid can still extinct us, unmolested, but we would rather channel funds to satisfy the delights of ignorant baby-boomers who are bummed because their useless moon landing buzz has worn off. NASA originally stood for National Asteroid Stopping Administration. But there aren't that many to stop so they do other things. Seriously though how would we gain the experience necessary to stop or detour an asteroid except through space exploration? 'Just shoot a crap load of a-bombs til we hit the dang thing'. The way you think we would still have sailing ships, writing with a quill and rubbing flint to make a fire. By the way you would have no computers since you would insist that we write on clay tablets. The point? one must explore. It costs time and money. The payoff? Technology allows you to respond to this article instead of using smoke signals. Lets continue to explore Mars. Maybe you will benefit. Learning more about the universe through environments and materials/processes that aren't available on earth is part of how technology is driven forward. Limitations? With nanotech, biorobotics and everything else in the pipeline, we will soon be without limits other than the physical laws of the universe. Ummm....it's springtime because Mars is getting closer to the sun? We learned in 3rd grade that it's because of the tilt of the axis that we have seasons, not the distance to the sun. I believe it works the same way on Mars. Reading a little closer, I guess they are saying distance is a factor in the seasons, but did not directly say that distance was a cause of springtime. With a more elliptical orbit, there is more variation in distance than on Earth. Mars's orbit is more eccentric than Earth's. (e = 0.0934 for Mars and e = 0.01671 for Earth) This leads to a larger variation of solar irradiance. At perihelion, the maximum available irradiance is 717 W/m^2, while at apohelion the maximum is 493 W/m^2. Curiosity is just south of the equator, so this effect will be more pronounced than the tilt of the planet. That's precisely the point though – on Mars the distance to the sun IS a factor, presumably because its orbit is currently less circular than the Earth's. "Mars Radiation Levels Tolerable to Humans. Everything Else on Mars Instantly Deadly." we need to drop the Space Race/NASA crap which is a waste of our money and resources. Instead we need an Education Race, were we set a National Goal regarding improvements to our education and 100% of our Schools. If we launched such a goal with the drive we put into the Space Race in the 60's we could revolutionalize our educational system and launch the next generations into brighter futures. The lost NASA jobs are nothing compared to the jobs we would create rebuilding schools and the jobs created from a better educated workforce. Why do you think NASA spending and educational policy have to be exclusive? Besides, kids love this stuff – it's what inspires them. When I hear buffoons like you decry NASA after stunning accomplishments like this I just sigh. Space exploration is such a small expenditure in the big scheme of things...it would never pay for the school improvements you speak of. Besides, why can't we do both? If we don't do science, what happens to the quality of what we can teach students in those shiny new schools? "... we need an "Education Race", "were" (??) we set a National Goal ..." I presume you'd be first to the start line? The human race is doomed to an inevitable extinction if we remain a one-planet species. NASA should receieve more funding that every branch of the government, including the military. If NASA would have received the proper amount of funding over the past several decades, we would probably be sending these drones to planets in other solar systems. "The human race is doomed to an inevitable extinction"
And this is a problem why? look, education starts and ends with the parents. If the parents do not care, nor will the kids. You can spend all you want and nothing will change. You need to change the culture of the parents. Excuse me, parent since most kids have no father in the house. Women love having kids and let their offspring run wild. Thank you liberials for the total mess you created. What's the point in achieving a higher education if you eliminate the lofty goals? Education for education's sake is much too parochial for this day and age. You have to give the kids a mission, some direction or a purpose to inspire them. Presently the US ranks #17 in the world in STEM (Science, Technology, Engineering & Mathematics); and this from a country that's landed men on the moon! In the sixties we ranked #1 in nearly every single educational endeavor, and we are STILL enjoying the fruits of THAT educational explosion. If you stop greasing the wheel, it will eventually fall off. The wobble has already begun. The USA has declined in smarts because the carrot has been removed from the stick because it was deemed by people like you that it was getting too expensive to hang out there. I've always told my friends and colleagues that there is NOTHING that we can not do, as long as we have the drive to do it. I keep looking at the Industrial Revolution, the Manhattan Project, the Moon Landings, the International Space Station, and the Genome Project & the Large Hadron Collider at Cern, just to name a few of the more expensive ones. If you take away the goals, you also take away the ambition. Besides, who appointed YOU to decide what is important or not? Yes, things have always done better when you retreat from areas and focus just on your nation. China did that 3 years ago and just 50 years ago. Of course, they have stopped that now. In the meantime, those of us that have read history, will continue to push for NASA and private space. We've already tried that. Many times. Here's the sad truth: there just aren't more than a certain percentage of people who can benefit from higher education or work in technical fields that require extensive mathematics. Or art. Or writing. Or any other skill you care to name. Despite the vast pots of money tossed at education over the years, the percentage of those passing standardized tests hasn't budged. Unless you resort to rigid drilling and promote only rote learning – which is useless in terms of creating anything new – you're never going to overcome basic human abilities. I think we need to take some of that money, and spend it on where we know there is life, EARTH! 95% of our oceans have never been explored yet, we spend on trying to find life elsewhere. Let's give some of this money to nations oceanographic society. I was really thrilled and shocked to see so many different life forms beneath or oceans. Some is the animals were completely transparent! Amazing! Think about the stupidity you just typed. Cut funding for programs that drive our understanding of the universe we live in, so we can limit the breadth of our knowledge gathering to focus on education. It's like you're saying "Sell all police cars in the United States so we can use the money to hire more police." NASA and all other driving forces of new scientific discovery are crucial not only to the advancement of technology but also of education. If you care at all about education, you've picked the wrong target for cuts. Cut the military, raise taxes, whatever – that's all politics. But don't cut one of the sources of knew knowledge. Personally I really enjoy reading and watching the news on the latest Mars rover. Despite the fact I agree the space program isn't as important as, say, curing cancer, it is a simple yet powerful symbol of our country's (and our species) desire to explore, discover, and invent. The only thing that can truly take our minds "out of this world" and off the stresses of the news, the economy, etc, is to hear of these things happening on another planet. It is one of the few tidbits of news I always enjoy reading and thus I will always support NASA and their mission. Now let's do something on our moon already, like a moon base, a launch pad, or even tourism for the uber rich. The moon is the obvious and easiest place for us to make our first BIG footprint in outer space, and it doesn't take months to get there. For the most part I agree with you. I too enjoy keeping up with all of the space missions. But, you mentioned that we should focus more on medical research. Don't forget about the myriad of medical "spin-offs" that we have been enjoying that found their initial origins in the space program. Much of that esoteric space technology is being used today in thousands of hospitals throughout the world. Evidently, the impetus for developing such medical technology for medical science alone, was not enough. It took the unbridled excitement of the space program to get that technology developed, and then finally was modified and transferred for medical use. Thank God for loftier goals. Trapped for 9 months one-way to Mars in a capsule the size of an SUV. BTW, did you know that Apollo astronauts didn't eat solid food during the trip so that they wouldn't have to smell each others' bowel movements? Better hope no one gets sick and dies during the trip to Mars. He'll either get pretty ripe or you'll have to dump him out an airlock. For what purpose? To risk several human lives in order to land somewhere that we've already seen with our rovers? Then you hope the return vehicle works for the nine-month ride home. For all that effort, a handful of humans will see Mars. The rest of us will not. Our robotic missions to Mars are doing way more science than a manned mission ever will. We can leave them there for years. We don't have to bring them back. It isn't a national tragedy if one of them breaks. Give it up. A manned mission to Mars ain't happening. Don't worry. Should the opportunity come up, you don't have to go. Brave and intellectually curious people are willing to take the risk. You can safely sit on your behind and complain on internet blogs about scientific advances, all without risking more than carpal tunneling. It's far better than what early travelers to the Americas had to put up with. Visit replicas of some of the ships used to ferry colonists here – they were incredibly small, and jammed with unbelievable numbers of passengers who knew nothing at all about cleanliness by modern standards. Then you should look up Bigelow Aerospace. Nobody is going to mars in a small capsule. NOBODY. Too bad obama totally killed NASA by killing thier budget. obama killed NASA, obama killed USA. Bush axed the space shuttle and we landed on Mars under the Obama administration. By the way, your party lost the election, haven't you heard? They lost the presidency, not the election. The House is still controlled by the Republicans, and in the Senate nothing has changed, either – they still hold enough seats to have serious influence there. Even their presidential loss was by a very slim margin, meaning Obama's claims of a mandate ring hollow with a significant portion of the electorate. They also expanded their presence in state governorships. And Curiosity was conceived and developed under the Bush Administration, just to be accurate. Um, more people voted Democrat than Republican in House elections, but it was nullified because of all the gerrymandering...if the GOP hadn't rigged the system, that election would have given the entire government to the Democrats. "more people voted Democrat than Republican in House elections, but it was nullified because of all the gerrymandering.."
First: what utter rubbish. Do you really have to resort to outright, blatant lies to support your position? Second: gerrymandering has been around for a long, long time and has been avidly practiced by both parties. It's one of the benefits of, you know, winning. If the Democrats don't like it, they should start winning Congressional elections so they can extend the practice to districts where they don't currently hold power, instead of contenting themselves with only doing it in the districts where they do. The dems got 2 more seats in the senate, and 6 more in the house. O won the general election by the same amount as W, and crushed W's electoral vote (the one in which neo-cons everywhere screamed that W had a mandate). Heck, O even beat Clinton's general %. I would say that the dems, in particular, O does have more of a mandate than did you neo-cons. And if the neo-cons continue to control the republican party, they will remain the party of special interest, esp. China. not really, NASA is still operating.. just space shuttle shut out! You people need to make up your minds. You want to blame Obama for spending, you want to blame him for not spending. Which is it? Or do you simply make the statement that is more convenient for you at the time, regardless of what you may have said five minutes before? This is why you lose. They want to blame him for being black, basically, but they don't want to admit it. That's the source of all the cognitive dissonance, as they try to find all kinds of irrational justifications for their racism. first off, when W got into office, NASA was .76% of the budget and when he finished, it was at .57%. Now, 4 years later, it is at .48%, but only because you neo-cons continue to cut NASA's budget. However, the REAL downer, is that you neo-cons pushed for Constellation, but then did not provide the funding, and are doing it again with SLS. Yet, the answer is for neo-cons to quit turning NASA into a jobs bill and allow NASA to help private space get going, while NASA returns to doing what they have historically done, which is advance cutting edge work. Thankfully, in 2013, SpaceX will launch FH and if successful, O and USA will be able to push you neo-cons back hard and we can FINALLY kill off your communist approach to space: we need to kill the SLS NOW!. I would like to nominate obama to be the first president on Mars. That way we can have a solid baseline of exactly how NOT to run a government. Plus, anyone could succeed him and do a much better job..........even Joe Biden or Jimmy Carter. Look at it as my gift to earth. See above; this statement doesn't make any sense. It's a real pity they don't make civics classes mandatory anymore, or you might have known that elections tend to be about many, many different things. Although a glance at the news on any random day ought to be enough to drive the point home as well. SixDegrees, you can't seriously argue that the recent election was a decisive loss for Obama-haters. Yeah, elections are about many things...the GOP lost every argument. By the way, the civics classes you took in elementary and high school contained about 10% of what you need to know to consider yourself an "expert" on political philosophy, so perhaps you should stop making a fool of yourself online. "SixDegrees, you can't seriously argue that the recent election was a decisive loss for Obama-haters." Comprehension problems? I'm arguing the exact opposite. "a decisive loss for Obama-haters." Actually, I was completely unaware that there was any official Obama-hating party, or that Obama hatred was on the ballot anywhere. Distort reality much? Oh, I think that it is fair to say that the neo-cons are the official O. Hater. Heck, there are now ppl running around exposing those ppl who hide like cowards on the net. SixDegrees, if person A is talking about the presidency, and person B replies, "you lost the election," most people would assume person B was referring to the presidential election. That's called context. Did they teach you that in grade school? The comment shows your lack of attention, or intelligence. I didn't lose the election............I didn't run for office. *God speed is of course the speed in which God travels which is, you know, pretty fast. Newt Gingrich already has a home on Mars. He wants an elevator in his garage like mitts,....with a roof high enough that the family dog has some headroom. Curiosity is just looking for diamonds and gold. It's all about $$$ to the shadow government that funds these programs. They could just end poverty if they would give people the money they spent on these programs. Every single adult person in the USA would be rich. They don't even want to try and provide health-care for anyone who can't pay for it themselves. We are just ants on an ant-hill to them. Useless "eaters" who need to be killed. 1) If everybody was rich, then prices would increase to balance it out. Its how the world operates, not everybody can be rich. 2) They aren't looking for diamonds, there probably isn't a ton of carbon on the planet to make the diamonds, and the Mars rover certainly cannot dig deep enough to actually find some, since it takes a lot of pressure to make a diamond. 3) The cost of this trip wasn't that much over the course of its existance, about 20 bucks a year for every person in the US. That isn't a ton of money and certainly isn't going to change anybody's life. WOW...you obviously don't know much! NASA's budget it a mere fraction of the overall budget. Not to mention the over 30,000 items in every day life that was spawned from the space program!!!!! I guess it's Internet Access Day at the group home. There's about 350 million people in the United States. If they took the money spent on Curiosity and divvied it up amongst us, we'd each get six dollars. So, you're rich now! Don't go spending it all in one place. Nice way of letting you know what they've been knowing for years now since humans have been on Mars since 1962. The sky is blue and is habitable...Alternative 3!!! Personally, I'm "sickandtired" of crackpots like you. But children of these first colonists will make a new ruling class, while the new arrivals would be mere peons for them. I'd take a risk and send some spare children before everything is settled. Christian's are looking for compromise to get the date closer to 6,000 years, now you've ruined it for them. Sorry everyone, that was a typo and you are correct. It is 3.5 billion years ago. All right. I just have to ask - who's working on the Warp drive? Anyone? No one? Better add that one to you "to do" list. Try doing a Google search. There was a major news event about NASA and warp drive about two months ago. NASA's is working on one concept. They're even moving beyond theory and starting to perform lab experiments. Of course, destroying the destination will not be a good thing. And to think, up until now, they told us that Mars was more or less radiation 'soaked'. Sterile soil, etc... The times, they are a changin', cautious estimate, be darned. Not sure where you are getting your information, but since viking, we KNEW that it was not 'radiation soaked'. But we also knew that it was more than Earth gets. Mars lost it's magnetic field 3.5 billion (not million) years ago. Big difference. Yes, I fixed this - 3.5 billion it is. Thanks! I hope that the colonization happens within my lifetime. Send a frozen embryo and bring it back. This is good news for a change . . .
We already knew this.DIdnt ya'll read Princess of Mars??????? John Carter lived there for like 20 years,and he gained super-powers. I enjoyed Edgar Rice B's Venus books as well as his Mars series during my early teen years in the mid 60's. We've been to Mars, have a colony there. 33 hour trip by speical shuttle. See Veterans Today, or Major Dane's interviews on youtube. Americans and the world have been lied to for decades. Time to catch up. But Mars is faked also ? More like it is time for you to clean up your meth lab and go for treatment. You need help dude. Captain, you are officially demoted. We need to travel to Mars to help diversify our planet portfolio, and we need to do it stat. But once we're there, the radiation will certainly kill us over time. Good luck, soldier, and god speed. Didn't I read that L. Ron Hubbard has a place on Mars? and something about a bunch of virgins?